Summary and Definition: The semi-nomadic Modoc tribe were fishers, hunter-gatherers and traders of the Plateau cultural group. The Modoc lived around Lower Klamath Lake, south-western Oregon extending across the California border including the Lost River Country and the famous Lava-bed region. The Modoc fought against white encroachment of their lands which resulted in the Modoc War (1872 - 1873 led by Captain Jack (Kintpuash). What language did the Modoc tribe speak? The Modoc tribe spoke in the Plateau Penutian language and shared many cultural traits with their neighbors the Klamath tribe and also the California Native American Indians. The name Modoc meant "southerners” and were known as a war-like, fiercely independent people who were often in conflict with neighboring tribes, including the Klamath. Both the Klamath and the Modoc tribes were important in the trade networks linking California to the Pacific Northwest. What was the lifestyle and culture of the Modoc tribe? The Modoc tribe lived in autonomous villages, each with its own chiefs, leaders, shamans, and medicine men. They lived a semi-nomadic lifestyle and spent the cold, snowy winters in semi-subterranean pit houses and in the summer used temporary tule-mat shelters made from the reeds and bulrushes found along the rivers. The Modoc lifestyle was based on the seasons. In the summer they fished around Lost River and the Tule and Clear Lakes and collected berries, seeds and roots from these areas together with regions south of the lava beds. They used tule reeds (bulrushes) to make a vast range of objects including their shelters, sleeping mats and some of their clothes. Sagebrush bark was used to make clothes and footwear and to make baskets. Where did the Modoc tribe live? The Modoc are people of the Plateau Native American cultural group. The geography of the region in which they lived dictated the lifestyle and culture of the Modoc tribe. What did the Modoc tribe live in? Pit houses, or earth lodges, were shelters were about 22 feet across and 4 feet deep and built with logs and sealed for insulation with dirt and grasses. Pit houses were built below ground with an entrance and ladder at the top and were generally used during the cold, snowy winter months. The summer shelter, the domed tule-mat lodge, was above ground. The tule-mat lodge was covered with mats of strong, durable, tule reeds (bulrushes). What food did the Modoc tribe eat? What weapons did the Modoc use? The weapons and hunting tools used by the ancient Modoc included bolas and Atlatls before the introduction of the bow and arrow. Other weapons included spears, clubs, knives and harpoons. What transportation did the Modoc use? The Modoc tribe used canoes made of strong and water-resistant pine, fir or cedar bark that could be easily bent, cut and sewn. The birch bark canoes were essential for the Modoc way of life. The Modoc hollowed logs with fire and then bark was stretched over a strong, but lightweight, wooden frame to make a canoe that could be easily steered. The Modoc constructed two types of canoe. A large canoe, they called a "vunsh" was suitable for open water navigation which was paddled and could hold four or five people. A smaller canoe, called a "vunshaga" held two people and was propelled by poling and primarily used to gather wocas seeds and duck eggs. What clothes did the Modoc people wear? The clothes worn by the men of the Modoc tribe wore shirts, kilts and leggings made of buckskin. The wealthy Modoc wore robes made of deer, elk or bobcat, whilst the commoner's cloaks were made from rabbit or bird skins. Moccasins were made from either tule or buckskin. They wore few clothes during the summer, just a breechcloth or kilt. The men also wore undecorated basket or fur hats according to the season. The women of the tribe wore a full length dress also made from twisted tule and buckskin, often decorated with beads and shells. In the summer they wore grass skirts. The women also wore highly distinctive woven basket skull caps. Captain Jack was the name given by the whites to the Modoca leader Kintpuash. The opening of the Oregon Trail and the Applegate Trail resulted in wagon trains of white settlers reaching Modoc tribal territories. Gold was then discovered in the lands with the arrival of prospectors and miners who joined the gold rush. 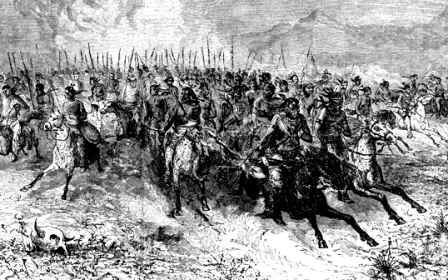 The encroachment of their lands and the inevitable culture clash led to various conflicts in the region including the Madoc War (1872-1873). The Madoc War erupted when the US government attempted to force a group of Modoc Indians to return to the Klamath Reservation in South Oregon. It was fought in Northern California and Southern Oregon and led by Modoc chief Captain Jack (Kintpuash). Captain Jack and his followers had fled from the reservation to the lava beds of Tule Lake, where they held out against soldiers for six months. In April 1872 President Grant organized an unarmed Peace Commission to meet the Modoc leaders but the meeting resulted in the killing of Major General Edward Canby and Reverend Thomas. The incident led to an increased US campaign against the tribe and the Modocs were forced to surrender. Captain Jack, and three other members of the Modoc tribe were hung on October 3, 1873 for killing General Canby. The surviving members of the Modoc tribe were sent to live in Indian Territory among the Quapaw Tribe. Modoc History Timeline: What happened to the Modoc tribe? The following Modoc history timeline details facts, dates and famous landmarks and battles fought by the Modoc Nation. The Modoc history timeline explains what happened to the people of their tribe. 1852: Conflicts escalate and Ben Wright leads a volunteer company in reprisal for the wagon train ambush. Modoc Native Indians attend a council with Ben Wright under a flag of truce and 41 Native Indians were killed with poisoned food. 1872: The Modoc War (1872-1873) led by Captain Jack was fought in Northern California and Southern Oregon. For additional facts and information refer to the legend and the Story of Captain Jack.